It is really important to understand that scratching is a natural behaviour and you will never be able to completely stop your cat from scratching. It allows your cat to maintain their claws and mark their territory via the scent glands on their paws as well as the visual scratch marks. Also, many cats simply enjoy it, whether it is part of their morning stretch routine or to help with a bit of stress-relief. Cats need to be discouraged from scratching what they are not meant to while at the same time encouraged to use their scratching post. Therefore, I highly recommend that you read how to get your cat to use their scratching post in conjunction with this article. Eventually, they should be consistently using their scratching post and you won't need to use any of these cat scratching prevention techniques. Naughty cat...! Caught in the act! So... how do you stop your cat scratching what they're not supposed to? 1. Restricting Access. To save the furniture you love it may be best to restrict access to certain areas of the house or to only allow supervised access while your cat is still learning to use their scratching post. Perhaps it may be worth putting the rug or the chest or drawers they have realised feels good to rub their claws across into temporary storage until you are confident they have learnt to use their designated scratching areas. 2. 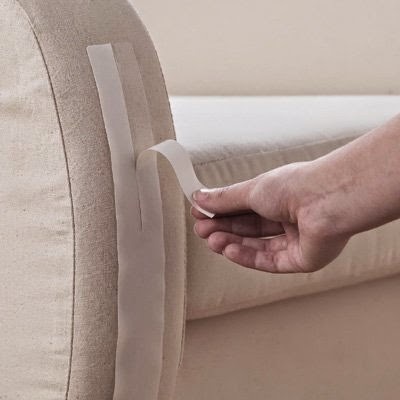 Double-Sided Sticky Tape. As most cats do not like having sticky paws you can cover any areas you don't want to be scratched with transparent double-sided sticky tape. It is fairly inconspicuous and therefore shouldn't be too noticeable. They may attempt to have a little scratch but once they realise their paws have become inconveniently hindered and the place that they once scratched is now attempting to stick to them, they will most like do the sticky walk of shame and go elsewhere. You can either buy an item such as Ve-ge Double Sided Transparent Tape or a purpose made product such as Sticky Paws. You can also try using Aluminium Foil or Masking Tape to cover any areas you do not want to be scratched, get creative! Keep problem areas protected until your cat is consistently using their scratching post. 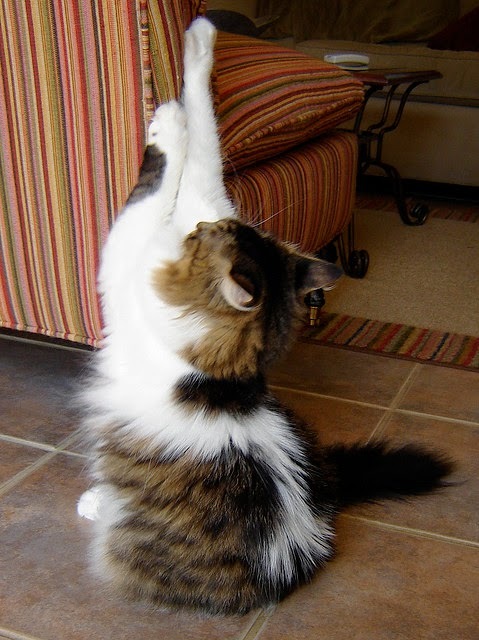 scratching the furniture. For the lowest price visit Amazon. 3. Cat Scratch Sofa Guards. 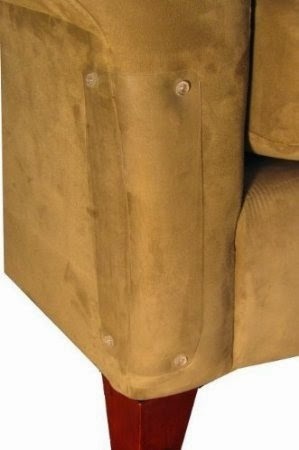 Cat Scratch Sofa Guards are sheets made from clear vinyl that conform to the contours of any sofa. They are both an unobtrusive and permanent solution. Unlike the sticky tape, they will also not collect hairs. most sofas. They also have excellent reviews on Amazon. 4. A Large Throw. 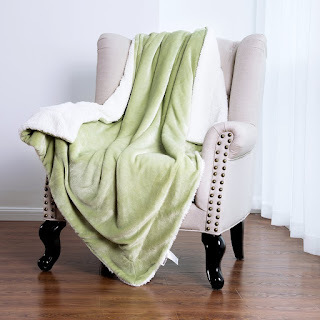 Why not simply buy a large, inexpensive blanket, such as the Luxury Fleece Blanket by Bedsure that is both low-cost and high-quality, to drape over and protect your furniture until you have effectively trained your kitty to use their scratching post. still in training, available for an extremely low price on Amazon. 5. Cat Deterrent Spray. Some people find that cat deterrent sprays do not work, it may simply be that they are not effective on some cats or it may be because they are not being sprayed frequently enough. To be effective sprays need to be applied every 24 hours until the scratch habit has been broken. 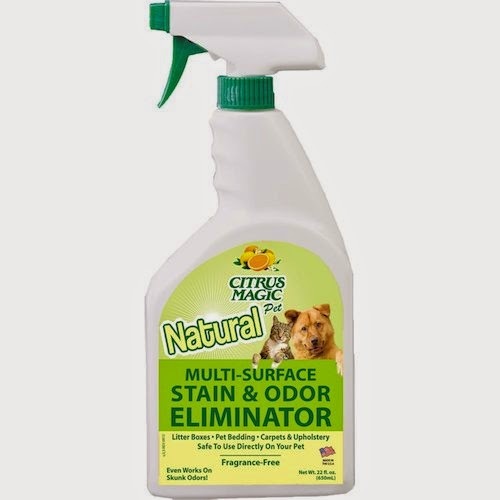 One of the best cat deterrent sprays, that also comes with an 180-day satisfaction guarantee, is Claw Withdraw Cat Deterrent Spray, which you can spray on your furniture or carpet. not work, for the lowest prices I recommend Amazon. 6. Pet Odor Eliminator. Since one of the reasons that cats scratch is to mark their territory you must remove their scent from the furniture, so that they won't be tempted to 'top-up' when it starts to fade. Citrus Magic Pet Odor Eliminator is my favourite product to use. It scores extra bonus points because of the citrus smell it leaves behind, which most cats hate. Use a good odour eliminator on all the surfaces that your cat currently scratches. Citrus Magic eliminates odours and repels cats with its citrus smell. For reduced prices and 5* reviews visit Amazon. 7. Trim Their Claws. Regularly trimming your cat's claws may help to slow down the damage caused to your furniture and carpets. Make sure you buy high-quality and easy to use nail clippers, such as the Pet Nail Clippers by Shiny Pet. 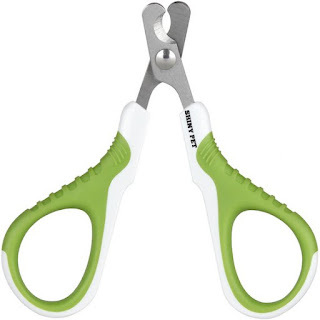 Cats claws are round and therefore these clippers with their curved edges are much more comfortable to use as they apply pressure evenly around the nail. Shiny Pet Nail Clippers are eco-friendly and 100% guaranteed. They have a 5-star rating as well as the lowest price on Amazon. 8. Soft Claws. This solution is often a last resort. Soft Claws are nail caps that cover your cat's claws so that they can't scratch your furniture. 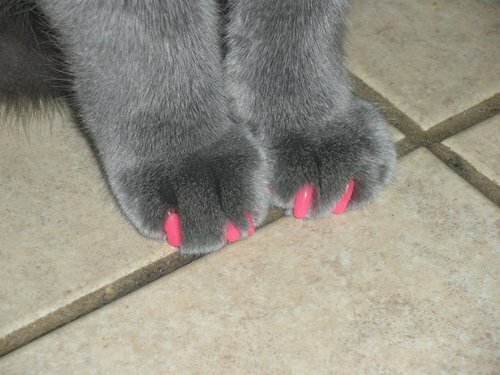 They come in a variety of colours and, yes, they make your cat look like they are wearing nail polish! They are easy to apply and last for 4-6 weeks. popular and have excellent reviews on Amazon. 9. Declawing. Please do NOT declaw your cat. The last joint in each toe is severed. How would you feel if someone literally chopped off the ends of your fingers so that your nails were completely removed? It is a painful procedure that can result in a variety of complications, such as continual bleeding or ongoing pain. 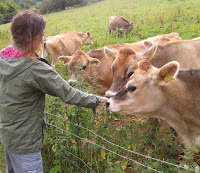 Some animal behaviourists report that it can also lead to behavioural problems, such as aggression and anxiety. Cats need their claws for climbing, defence, balancing and grasping, so please leave them be. 10. Avoid Punishment. Shouting, loud noises, spraying water and motion sensors are all forms of punishment, which can be confusing for a cat that is simply carrying out a normal behaviour. Punishing a cat can also create anxiety and damage your bond with them. They may also just learn to just scratch when you are not there, and so the problem has not been solved. Rather than punishment, I would recommend using positive reinforcement and clicker training techniques to stop your cat scratching the furniture. More can be learnt about these methods in Marilyn Krieger's book Naughty No More. Clicker training is a fun way to teach your cat to not scratch the furniture while spending some bonding time together. scratching the furniture, available on Amazon. BONUS TIP! You can't completely stop your cat scratching so you need to provide them with the purrfect scratching post and it must also be purrfectly placed. Please read my tips on how to get your cat to use their scratching post for more information. Once they are consistently using their scratching post it should (hopefully) not be necessary to continue using the above techniques to protect your furniture. I never thought of using motion sensor sprays before, great tip! Thanks. I agree on the motion sensor spray, it will help protect my furniture even when I am not there. Thanks for the info. my cats ignore the spray. I have tried 4 varieties but from day one, it did not deter them. The sticky tape was a waste also. I'm going to try the foil next. One cat uses the carpet and any chair back, side or seat. I have tons of scratching posts but that one cat ignores them. Cat nip doesn't work either. This cat doesn't like treats either. I bought tuna fish in a can, foil pouch and fresh and she didn't like thoses either. I also tried fresh chicken and other fish. No go. She has caused a lot of damage, over $500 in the furniture. I hope the foil works. Keep your fingers crossed for me. My husband really dislikes this cat now. WOW!! Very informative blog and useful article. Thanks for share this nice blog Thank's for sharing. Thanks for this solution, sometimes we just need to keep it simple! Tried the tin foil - the cats were trying to tear it up WHILE I was placing it on the couch. I have three cats, it didn't bother any of them. They all just wanted to eat it. I went ahead and put it on the couch - I had not even stood up yet and one of the cats grabbed a mouthful. They ignore the spray. Nothing I do works. They have more scratchers than I can count. But all they want are the corners of my couch. I guess I'm going to but those furniture corner covers. I don't know what else to do. Like Dawn my cats LOVED the tin foil - they thought it was great fun! The Lion Tamer spray worked on my cats, but I did spray it a few times a day until they discovered that the new cat scratcher is pretty cool. The Claw Withdraw no scratch spray worked miracles for us. The sticky tape was so-so but collected a lot of hair and was not very attractive.